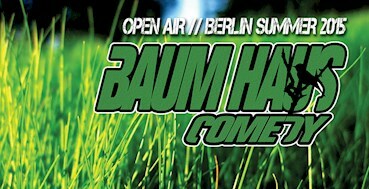 This event "Baum Haus Comedy Open Air" @ Griessmuehle has already ended on 08/27/2015. Here you can find upcoming events for this location! Please join us for Baum Haus Comedy Open Air outside at the incredible Griessmuehle open air venue in Neukölln. Come and see some of Berlin’s finest English Language Comedians alongside some amazing international guests. The venue is stunning, Tree Houses, BBQ, fully covered stage area, Open Fire, DJ's & Sunset by the river. Comedy show from 9pm in fully covered area! You are welcome to bring your own food to cook on the BBQ. There will be a BBQ that you are welcome to use, we will provide the coals, just turn up and cook your food.